The Ask: Lead the design and testing for an intuitive monthly billing payment option to meet enterprise expensing needs. This required collaboration with finance, development and leadership teams. In parallel I helped in the development of distinct personas that could be used for this project and others. While the technical constraints were outlined, the customer experience needed to be worked through and visually documented to communicate across teams and stakeholders. Working alongside a product manager, I created flowchart, system diagram and phase sequencing visual that outlined the mechanics of monthly billing. These were mapped to the customer journey to ensure the development provided a cohesive end experience. I delivered annotated wireframes and oversaw visual design for each phase as the feature progressed. Ultimately these documents helped explain our vision to stakeholders and set the example for a smooth workflow between design and engineering that was modeled to other groups within Uber. The monthly billing project is projected to have a significant impact on the team’s annual revenue, with a 25% increase of new companies enrolling and 10% uplift in activity from existing accounts. Realizing the team’s need to better identify with those using our business platforms, I collaborated with Uber’s head of research in a persona generation off-site. Bringing together the diverse stakeholders provided a variety of customer lenses and created alignment towards who we are designing for. Following the workshop, I lead the convergence and synthesis efforts to translate the vast information captured into a usable tool. The outcome was a set of 7 distinct personas that supported the Uber for Business team (30 people) as they continued to design and iterate on various products. They served as communication pieces for planning and decision-making, and an instilled a sense of empathy for our end-users. Persona Workshop: Collaborating with Uber’s head of research, we extracted customer insights from designers, product managers, business development and customer support roles. Persona Synthesis: I drove the post-workshop synthesis efforts to cull the broad learnings by systematically grouping according to activities, goals and product needs. This resulted in 7 distinct clusters that make up our user types. 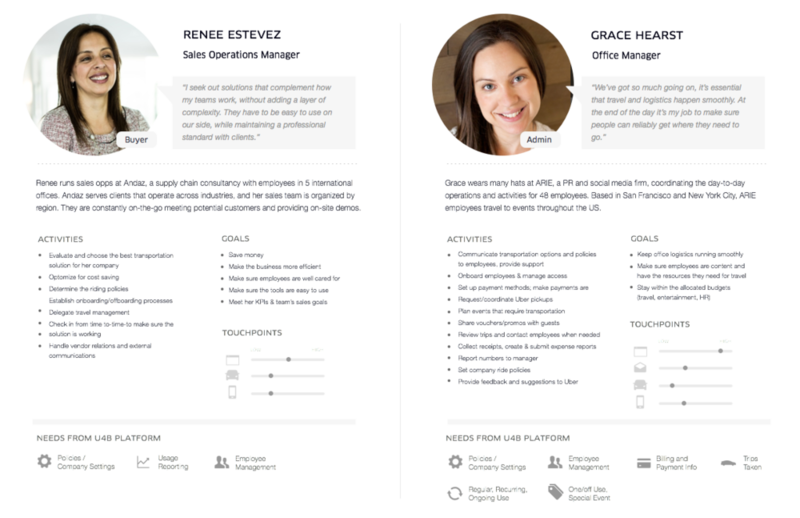 U4B Persona Placemat: I translated the data groupings into persona placemats to consistently channel the voice of our users while maintaining speed and quality throughout product development.